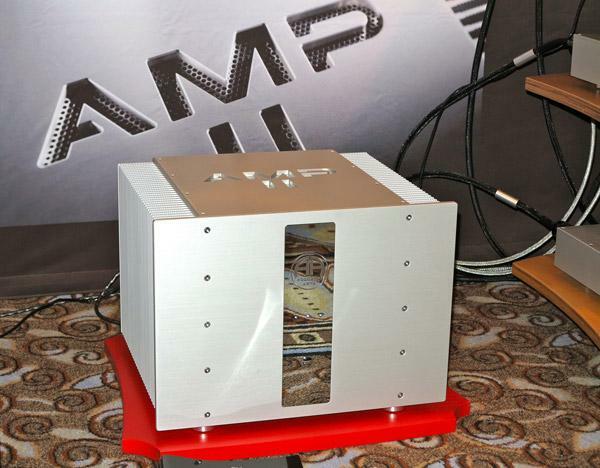 "I am a substantial amp, and I deserve your attention," Accustic Arts' new, pure class-A AMP IIMk.2 dual-mono power amplifier ($11,000) seems to declare. Its aesthetics certainly got me to take notice. The 121 lb amplifier includes 24 MOSFETs, and both balanced and single-ended inputs and bi-wire/bi-amping speaker terminals. It outputs 250Wpc into 8 ohms, and 500 into 4. Also available, albeit not pictured, is Accustic Arts' fully balanced, tube hybrid TUBE-PREAMP II ($6500), with 3 XLR and two RCA inputs, and 2 XLR and 1 RCA outputs. 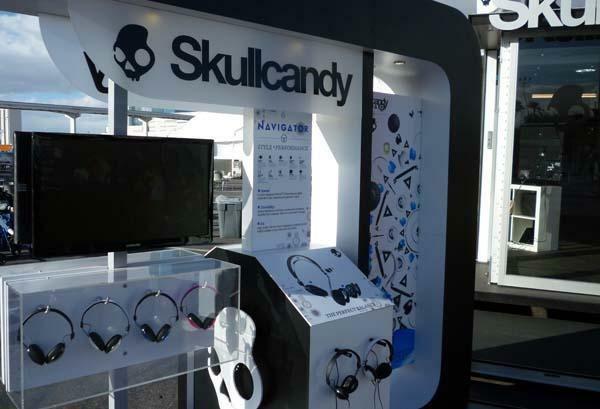 The company also makes a transport, DAC, streamer, cables and accessories. While these products, handmade in Germany, have been out for a while, this appears to be the first time they've become available in the US. 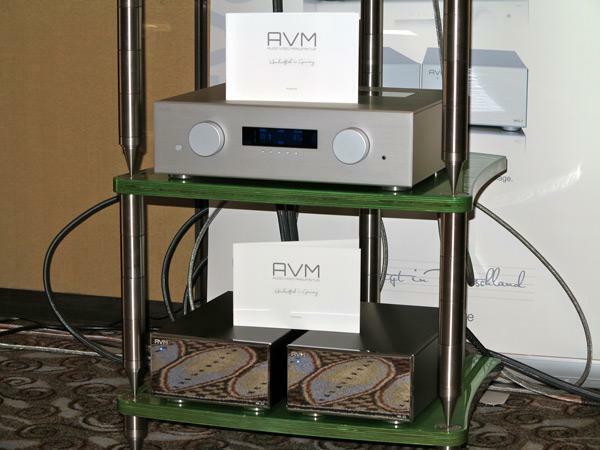 AVM Audio of Germany introduced its 425Wpc MA 3.2 monoblock amplifiers ($5500/pair) and PA5.2 analog tube preamp ($6600). The latter is an extremely versatile, fully balanced design with tube output stage, home theater bypass, and the ability to add additional DAC, phono preamplifier, tuner, and streamer modules. 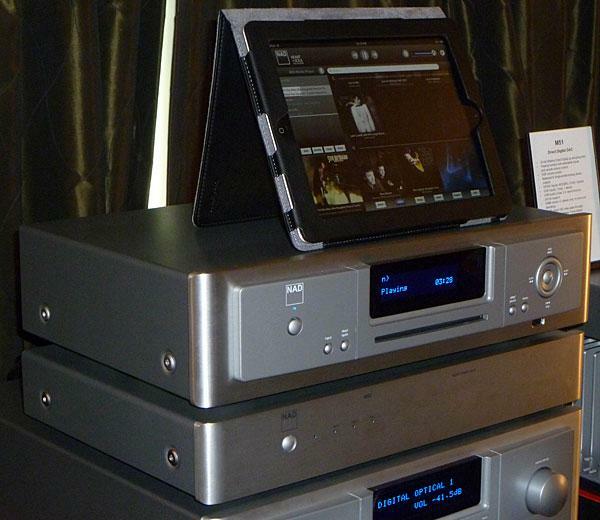 NAD greatly impressed me with their M51 bitstream DAC. Next, they've taken on the streamer/music server market with the M50 ($2499) and M52 Digital Music Vault (1999), both available now. The M50 has WiFi, ethernet, USB and HDMI to handle PCM files up to 24/192 and has a CD slot for ripping discs and retrieving metadata. Streaming services should be available as options in about six months. For storing files, the M52 connects via USB and runs a 3TB RAID 5 Array. All functions can then be controlled via NAD's iPad app. Norwegian Manufacturer Electrocompaniet had two new digital products this year. 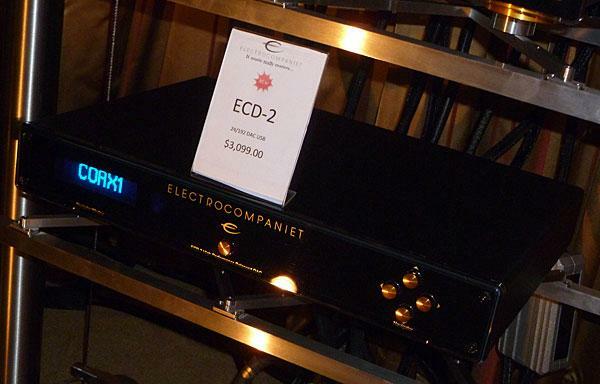 The first is the ECD 2 Reference DAC retailing at $3,099 and available now. It features balanced and unbalanced outputs, 24/192 SPDIF Coax and new this year, USB. The ECD 2 upsamples and uses 24/192 processing throughout. 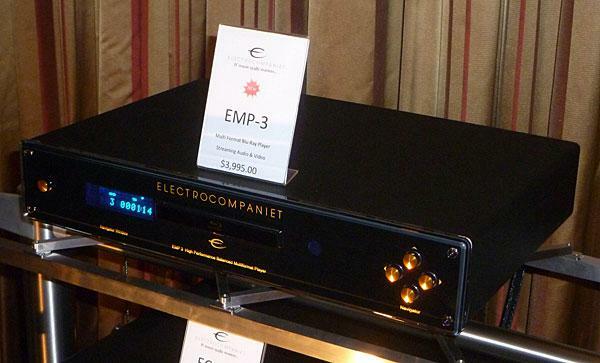 The EMP 3 is the company's latest version of an upgraded Oppo player and retails for $3,995 and is available now. They start with the Oppo 103, leave the video section alone, and rip everything else out. The put their own 24/192 DAC in the box and replace the Oppo op-amps with all discrete circuitry in a final design very similar to the previous EMP 2 model. Being based on an Oppo means it will play just about any audio disc you have on hand and also do 3D Blu-ray and upscale video to 4K if you have a display to handle it. On the audio side, there is also a separate balanced stereo analog output added by Electrocompaniet. For those of us in search of the best bang-for-the-buck enhancements to our systems, and the cables that best complement our components, Ultra Systems and the Cable Company are a favored one-stop gold mine. At his table at T.H.E. 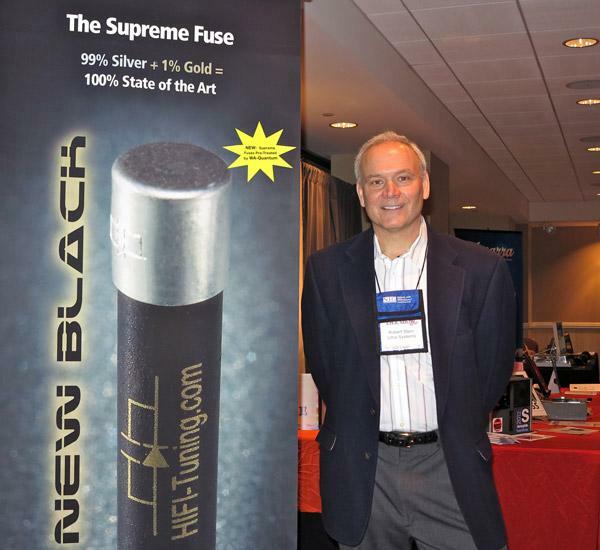 Show, the company’s Robert Stein (pictured above) spread the word that the excellent HiFi Tuning Supreme fuses he markets now incorporate Quantum level treatment from WA-Quantum. These are the folks who also make the Quantum chips that you put on components and speakers. I need to play with the latter some more before I get a handle on what they do or don’t do to the sound of the Wilson Audio Sashas currently in my reference system. Centrally located between exhibits and near the lunch area in T.H.E. Show’s downstairs area of the Flamingo Hotel, a host of exhibitors had set up displays. 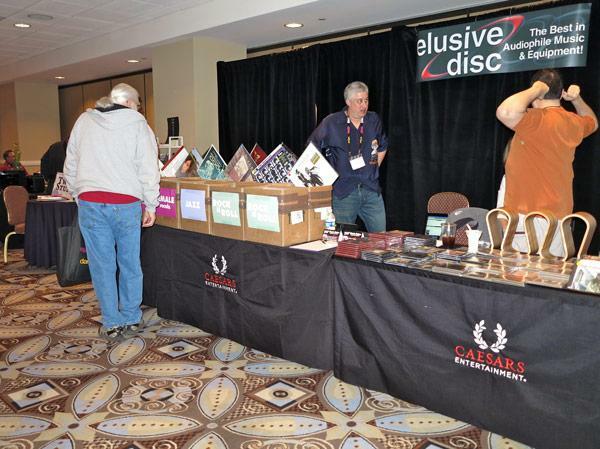 Here, the folks at Elusive Disk take a breather before helping yet another vinyl and CD enthusiast explore recordings new, old, and remastered. Among other vendors was Todd Garfinkle of MA Recordings, with whom I discussed holding a listening discovery party at Casa Bellecci-Serinus for members of the Bay Area Audiophile Society. 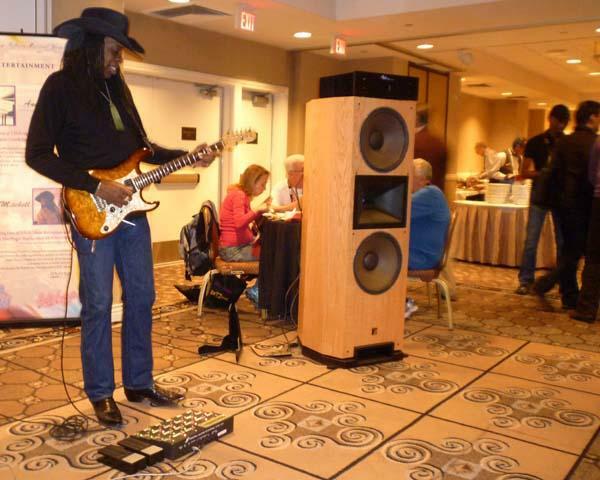 Drawn by the scent of hot food, I wandered into the Flamingo Hotel's Red Rock Ballroom and was pleased to find Grammy award-winning producer and guitarist Larry Mitchell playing sweet, soulful blues. 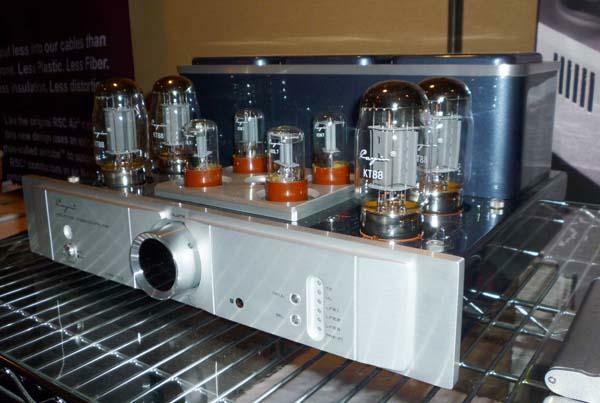 Cayin’s beautiful new A-88T Mk2 integrated amplifier ($2500) is rated to deliver 25Wpc in triode mode or 45Wpc in ultralinear and uses pairs of 6SL7, 6SN7, and KT88 tubes. Fit and finish were excellent. Sam Tellig favorably reviewed the original A-88T in our December 2005 issue. 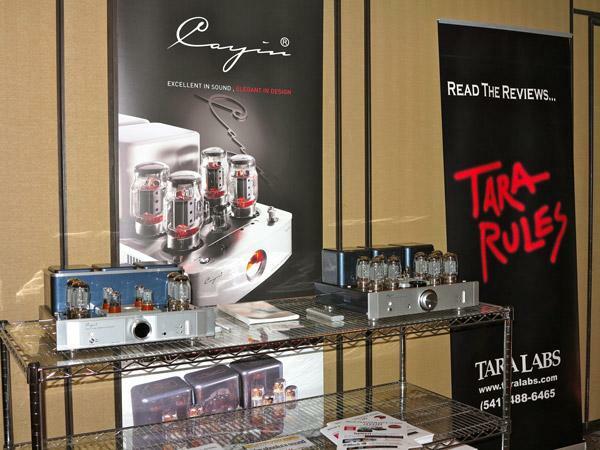 Sharing the room with Cayin was cable manufacturer Tara Labs. No one from Tara Labs was present when I was in the room, but I did learn that the rectangular solid-core RSC Air series has been redesigned with new red sleeving. Look for the new Air 1EX interconnects with anti-corrosion coated copper braid shield, as well as other new products. 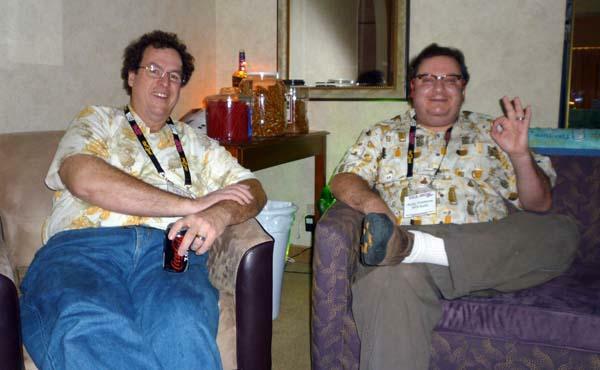 My old friends, Big Mike and Anton of NFS Audio. Over at the Flamingo, exhibiting at T.H.E. Show, the pair were having a good time, listening to Lee Morgan through a system comprising Yamaha NS1000 and Infinity WTLC loudspeakers, a Yamaha CR3020 receiver, a Sony PSX800 turntable with Monster Sigma Genesis MC cartridge, and an Oppo disc player. 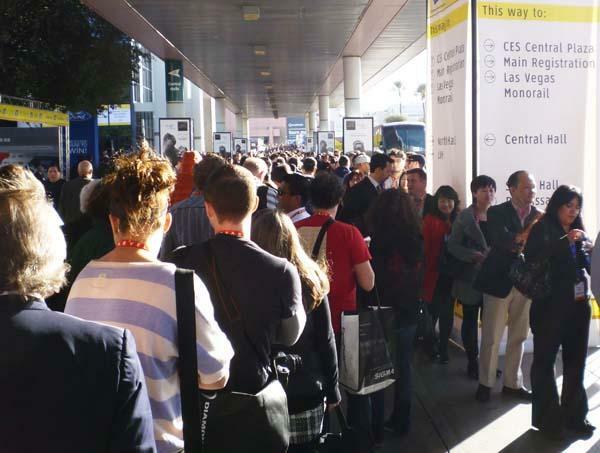 Reports state that, with over 150,000 attendees and nearly two million square feet of exhibit space, this was the largest CES ever. Over at the Venetian, where most of the high-performance audio exhibits were held, things were civilized compared to the madness of the Las Vegas Convention Center. This photo serves as a reminder of that madness. In Las Vegas, this is a short line. With his Renaissance Edition components, Red Wine Audio’s Vinnie Rossi says he aimed to fuse traditional and modern design elements. 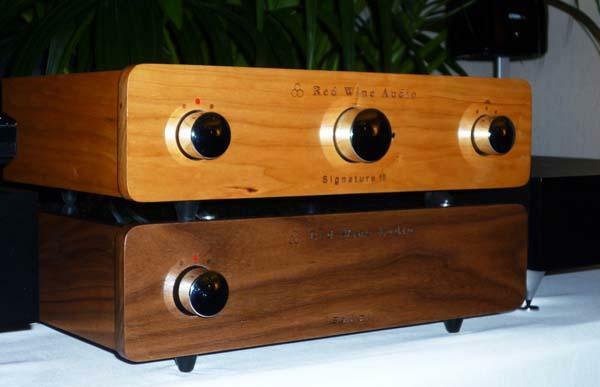 The battery-powered Signature 16 integrated amplifier ($1995) has a beautiful real wood chassis and a chrome top plate held in place with simple thumbscrews for easy access to the tubes inside. The amp is rated to deliver 16Wpc into 8 ohms. 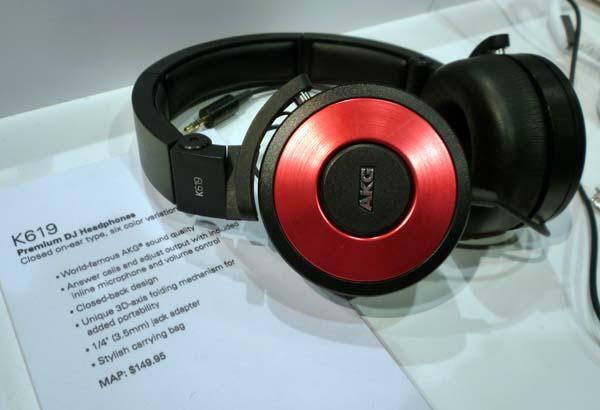 Harman’s Jeremy Brenner introduced me to AKG’s new K619 on-ear headphone ($149), designed to provide exceptional comfort and portability, while maintaining the level of performance one would expect from AKG. “We want people to know that they can look good without sacrificing quality,” said Brenner.